The Models 8201-M5 and 8201-M10 Piezoelectric Accelerometers are small, completely self-contained vibration measuring systems having a built-in amplifier within the housing. These units are offered with sensitivities of 5 mv/g and 10 mv/g for the measurement of low to medium level broadband frequency vibrations. Both units incorporate a ring-shear crystal mass assembly within a rugged, stainless steel body to provide an extremely reliable sensor that is virtually insensitive to environmental inputs such as base bending and thermal transients. The isolated case construction provides exceptional electrical isolation. 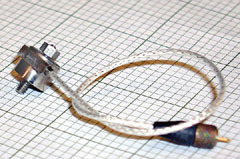 The units are supplied with Columbia's exclusive microminiature detachable cable and connector assembly as well as a 3-foot low-noise coaxialcable. 0.005 g RMS Equiv., Nom.